The sun let loose its most powerful eruption in more than four years Monday night (Feb. 14), disrupting radio communications in China and generating concern around the world. But it could have been a lot worse, experts say. Despite its strength, Monday's solar storm was a baby compared to several previous blasts, and it provides just a hint of what the sun is capable of. A true monster storm has the potential to wreak havoc on a global scale, knocking out communications systems, endangering satellites and astronauts and causing perhaps trillions of dollars in damages. The sun's activity cycle is ramping up, so more storms will likely be coming our way over the next few years. The sun has grown more active over the last several months after rousing from a quiet period in its 11-year weather cycle last year. That's not to say the big one is imminent, experts say — but you never can tell. And analysts warn that with humanity more dependent than ever on the high-tech equipment that can be affected by a solar storm, the stakes are higher than in the past. "Even if this is a really lackluster solar cycle — as it looks like it's shaping up to be — that doesn't mean you can't have a real bell-ringing event," said Joe Gurman of NASA's Goddard Space Flight Center, project scientist for the agency's sun-studying STEREO spacecraft. Solar storm events come in several different flavors. Solar flares are intense bursts of radiation that send waves of photons streaming toward Earth. The scale measuring their strength has three general categories – Class C, Class M and Class X – with Class X flares being the most powerful. Monday's Valentine's Day solar flare registered a Class X2.2 on that scale. Other storms, known as coronal mass ejections (CMEs), are large clouds of plasma and magnetic field that erupt from the sun's surface, sending lots of particles our way. Both flares and CMEs have the same root cause — a disruption of the magnetic field in the sun's outer atmosphere. And both events can affect life here on Earth. Major flares, for example, can interfere with satellites, causing disruptions in GPS and high-frequency radio communications that can last from a few minutes to a few hours. These impacts are felt almost immediately, since it only takes light about 8 minutes to travel from the sun to Earth. 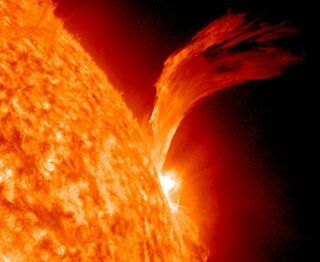 "It's like the sun is a giant noise source," said Bob Rutledge, head of the forecast office at the National Oceanic and Atmospheric Administration's Space Weather Prediction Center. "It can disrupt anything that depends on a link between the ground and satellites." But the most severe damage comes from powerful CMEs. The particles from these outbursts take longer to reach us — up to three days or so. But when they get here, their interaction with Earth's magnetic field can cause massive "geomagnetic storms," which have the potential to wreak long-lasting havoc on power and communications infrastructure around the globe. "They can cause a lot of trouble," Rutledge told SPACE.com. Last year, NASA launched its so-called Solar Shield project to serve as an early-warning system for serious space weather events. Monday night's storm produced both a big solar flare and a CME. Wdespread satellite or communications disruption, however, is likely not in the cards. "We don't expect this to cause any kind of lasting damage to our infrastructure," Rutledge said. But Earth has been walloped by monster solar storms before. One of the most powerful hit us in 1859, a blast that Rutledge estimates may have been 30 times more powerful than Monday's event, though it's tough to put hard numbers on such comparisons. The 1859 storm shorted out telegraph wires, causing fires in North America and Europe, and spawned spectacular auroras — the light shows visible near Earth's poles — bright enough to read by, according to some accounts. If the 1859 storm occured these days, it would likely have devastating impacts, since our electrical and communications infrastructures are so much more developed. A recent report by the U.S National Academy of Sciences found that such a severe storm could cause up to $2 trillion in initial damages by crippling communications on Earth and fueling chaos around the world. It might take up to 10 years for authorities to re-assert control and get everyting fixed, the report concluded. For comparison, Hurricane Katrina likely inflicted somewhere between $80 billion and $125 billion in damage. The sun works on an 11-year activity cycle, and it's currently gaining strength. Forecasters now expect peak activity might occur in 2013 or 2014, Rutledge said, though nobody knows for sure. So more flares and CMEs should be headed our way over the next several years. So far, the sun has been relatively quiescent during this cycle, so perhaps peak activity won't compare to the maxima of previous cycles, researchers said. But a big, Earth-shaking blast could come screaming at us all the same, and researchers are monitoring the sun closely. "This has been a remarkably quiet solar cycle," Gurman told SPACE.com. "But that doesn't mean there won't be a big event."